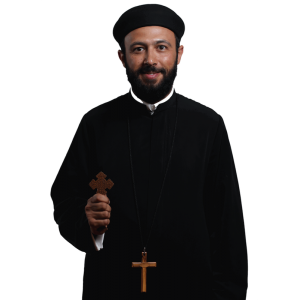 Father Antony Nassif Selim was born in Egypt in 1977. He graduated with a Bachelor of Science degree in Commerce, Department of Foreign Trade, from Helwan University and studied at the Theological Seminary in Cairo. He served at Saint George Coptic Orthodox Church in Heliopolis, Cairo until his ordination as presbyter by His Holiness Pope Shenouda III on June 16, 2005. He served briefly at Saint Maurice and Saint Verena Coptic Village in Big Bear, as well as Saint Mark’s in Honolulu until his arrival at Saint Abanoub and Saint Antony’s in Norco in October 2006.